Terrence Ross Jacks was born in Winnipeg, Manitoba, in 1944. March 29, 1944, Winnipeg, Manitoba. During his career as a recording artist he became a household name and recognized as a singer, songwriter, record producer and environmentalist. His family moved to Vancouver in 1961 and he formed a band named The Chessmen along with local guitarist, Guy Sobell. The Chessmen had four singles that made the Top 20 in Vancouver, two which were double-sided hits. These included “Love Didn’t Die”, “The Way You Fell” and “What’s Causing This Sensation”, and Top Ten hits. Jacks met Susan Pesklevits who had him recommended to her by a friend who knew she was looking for a rhythm guitarist. Pesklevits needed a rhythm guitarist to help with her upcoming gig at the Elks Club in Hope, British Columbia, in early September 1966. They were married in 1967 and she became Susan Jacks. In 1967, along with Craig McCaw who had been a member of the Kelowna band The Shadracks, they formed a trio called Powerline. They changed their name to The Poppy Family and Craig subsequently sought out a young tabla player in Vancouver named Sawant Singh. Terry and Susan Jacks agreed to have Singh join The Poppy Family. By 1968 The Poppy Family had a regional #2 hit in Vancouver with “Beyond The Clouds.” Their follow up in 1969 was a gentle anti-racist, pro-environmental, pro-marijuana legalization tune titled “What Can The Matter Be”. Their next single, “Which Way Is Going Billy?” went #1 in Vancouver in became an international hit. Terry Jacks won a Juno Award for this recording. The Poppy Family racked up numbers of Top 30 singles in Vancouver through to 1973 including local #1 hits “I Was Wondering” and “That’s Where I Went Wrong”. Concurrently, Terry Jacks released several solo records. The first was “I’m Gonna Capture You” followed in 1972 with the pro-environtalmentalist tune “Concrete Sea”. “No Good To Cry” was the third of six singles released on the Poppy Family’s second album, Poppy Seeds. The singles from that album were released in 1971 and 1972 in the following order: “I Was Wondering,” “Where Evil Grows”, “No Good to Cry”, “I’ll See You There”, “Good Friends” and “I Thought of You Again”. “No Good to Cry” was a cover of the Connecticut band, The Wildweeds. Written by their band member, Al Anderson, the Wildweeds had a regional hit with their song in Connecticut and Massachusetts in 1967. The Wildweeds, incidentally, were an opening act for The Doors, at a concert at the Oakdale, in Wallingford, CT, in September 1967. The Wildweeds sound was a white soul/rock blend, reminiscent of the Buckinghams. The Wildweeds climbed to #88 on the Billboard Hot 100 with their original version of “No Good To Cry”. 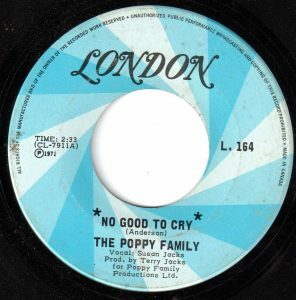 The Poppy Family toned down the song when they recorded it, creating a minor pop-country hit. The song peaked at #7 in Vancouver. Elsewhere, “No Good To Cry” made the Top 30 in Toronto, Regina (SK), Montreal, Sarasota (FL) and Seattle, Spokane and Olympia, Washington. On the Billboard Hot 100 the Poppy Family climbed into the zone the Wildweeds managed and in their case stalled at #84. “No Good To Cry” is about actions speaking louder than words, the action being ditched by someone you love for someone else. The subject of the song has previously left their former lover with only this brief summary: “we’re thru.” Not in the habit of taking time to communicate, they hook up with someone else who is undependable and unreliable. Once a new boy comes to town, the new girlfriend has ditched this guy who left his ex without hardly saying a word. People in the song are moving toward whoever turns them on without any regard for being accountable for whatever relationship they were forming until suddenly breaking it off. What can account for just breaking things off without hardly saying a word? When communication between two people is healthy, chances are that when there are bumps in the road the couple can talk things through. But if a relationship is toxic, sometimes taking the time to talk about it can lead to confusion, guilt trips, hysteria, threats, violence, and a return to the cycle of behavior you want to get away from. While taking time to give closure to a relationship by explaining your decision to end things, and what led to it, can be well intended, often the person who is hearing in so many words “were thru,” is in no mood to hear the reasons why. If you do take the time to explain why a relationship isn’t worth working on anymore, be kind, wish them happiness, but don’t get into an argument. The person who you’ve ended the relationship with might want to get back together. They might cry on other friend’s shoulders and try to get others to advocate for making up. Whatever the reason for the break-up, it’s useful to be aware of patterns you are setting in motion for how you end relationships. If you find yourself dating someone early into a relationship that you aren’t communicating with very well, ask yourself why continue dating. The Poppy Family’s next single from the album, Poppy Seeds, was “Good Friends”. This follow-up hit extended the musing about what people say to each other when a relationship ends. you never know what makes it end. well he don’t want me. Cause this ring and everything means nothing anymore. for the love that died here yesterday? Susan Jacks went on to record over a dozen singles that charted on either the Canadian pop charts, the country or the Adult Contemporary charts in the nation. In the midst of her string of hit singles she had a son and took a few years out of the music scene as a young mother. She married Canadian Football player Ted Dushinski in 1980. She won a Juno nomination for her single, “All The Tea in China”, in 1982, which charted best in Ottawa. In 1983 Jacks moved with her family to Nashville, Tennessee, and had a award winning country hit titled “Another Woman’s Man” in 1984. She became a staff songwriter in Nashville. After her husband died in 2004 after a cancer diagnosis, Jacks moved back to Canada only to suffer kidney failure. Some years later her brother, Billy, donated a kidney for a successful transplant operation. More recently she has faced health challenges again with her kidneys.